Your chance reenact one of the best dinosaur scenes in movie history is only $100,000 away. Unlike happy-go-lucky dinosaur movies like The Land Before Time, Jurassic Park made it clear from the get-go that its dinosaurs were on the dangerous side. Arguably key to this representation was the movie's opening scene where an unfortunate gatekeeper winds up on the evening snack end of a caged velociraptor. As you can imagine, things don't go well for the poor smuck. That said, if you've ever wanted to reenact the scene yourself (which you know you did), a new eBay auction may just be the ticket you're looking for. 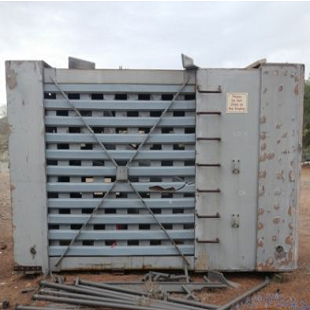 The auction in question is for a cage that, according to the seller, is the same "full size animal transport cage crate featured in the terrifying opening scene of the classic blockbuster movie!" If that weren't enough to stoke the flames of your inner child, the cage also comes with a prop raptor used in the film. Unfortunately, purchasing this kind of cool doesn't come cheap. As of right now the auction has already accrued 153 offers. The current high bid, in turn, is resting at a daunting $99,900.10. It should be noted that this price won't even include shipping, which we can only imagine will be pretty danged pricey all on its own. In other words, it's going to cost you an arm and leg if you really want to bring this sucker home. That said, as far as movie props go this one's pretty cool, so we it might just be worth it.